Sell 1 oz Silver Kitco Rounds struck with .9999 silver bullion. These collectible silver rounds feature the Kitco logo, an intricate vault door design, and cities with Kitco News and physical bullion operations. Kitco 1 oz Silver Wafers also feature clear markings of their guaranteed one troy ounce weight, .9999 fine silver bullion purity, and the 2010 year of their mintage or strike. Why sell Kitco 1 oz Silver Rounds to Kitco? 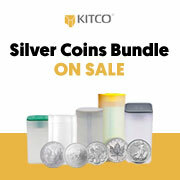 The 2010 Silver Kitco Round(s) you sell and deliver to us do not have to be in absolute mint condition.